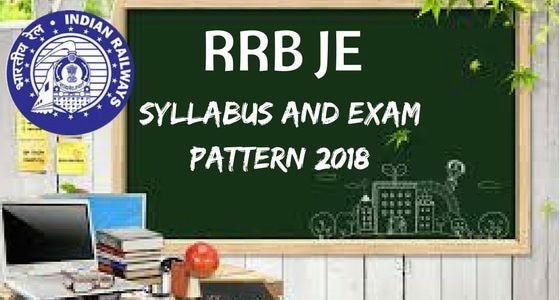 RRB JE Syllabus & RRB JE Exam Pattern 2018 -19: People those who are planning to appear for RRB Junior Engineer (JE) should start preparing for it as these exams are extremely competitive as a large number of people apply for the same. If a candidate wants they can visit the official website i.e. rrb.gov.in to refer to the RRB JE Syllabus 2019. In this article, we have provided all the details regarding RRB JE Syllabus for the convenience of candidates planning to appear for the same. The syllabus plays an important role in qualifying the exam. Knowing the RRB JE Examination pattern and syllabus 2019 will help candidates score better in the exam. Hence, we advise the applicants to download Railway Recruitment Board JE Syllabus 2019 from the website and start with the preparation. To know the exam pattern for the RRB JE Exam 2018 -19, candidates can refer to the RRB Junior Engineer Test Pattern on the below-mentioned table in order to know the scheme of the examination. The Indian Railways Exam consist of Objective type Multiple Choice Questions (MCQ). And the candidates will be given 1.5 hours for Railway Recruitment Board (RRB) JE Exam. And the total numbers of questions are 100. First Stage exam will be a Computer Based Test. Objective Type Multiple Choice Questions. Subject wise marks and question division is explained below. Total 100 questions in the examination. Total time allotted is 90 minutes or 1.5 hours. 120 minutes for candidates working with the scribe. Subjects included: Mathematics, General Intelligence & Reasoning, General Awareness, and General Science. Second Stage exam will also be a Computer Based Test. Total 150 questions in the examination. Total time allotted is 120 minutes or 2 hours. 160 minutes for candidates working with the scribe. Subjects included: General Awareness, Physics & Chemistry, Basics of Computers and Applications, Basics of Environment & Pollution Control, and Technical abilities for the post. The candidates will be appearing for the written examination as the first round of selection process for RRB Junior engineer Recruitment 2018 -19. The candidates are provided with detailed RRB JE General Ability Syllabus 2019 and another technical subject syllabus. RRB JE Syllabus for Electronics Engineering subject is given below. The candidates who are appearing for the examination must see to it that they prepare for the Technical paper according to their respective choice of Electronics Engineering Syllabus. RRB JE Syllabus for Electrical Engineering subject is given below. The candidates who are appearing for the examination must see to it that they prepare for the Technical paper according to their respective choice of Electrical Engineering Syllabus. RRB JE Syllabus for Civil Engineering subject is given below. The candidates who are appearing for the examination must see to it that they prepare for the Technical paper according to their respective choice of RRB JE Civil Engineering Syllabus. RRB JE Syllabus for Information Technology subject is given below. The candidates who are appearing for the examination must see to it that they prepare for the Technical paper according to their respective choice of RRB JE IT Information Technology Syllabus. RRB JE Syllabus for Chemical Metallurgical subject is given below. The candidates who are appearing for the examination must see to it that they prepare for the Technical paper according to their respective choice of Chemical Metallurgical Syllabus. RRB JE Chemical Metallurgical Assistant Syllabus is not much elaborated we advise candidates to read and be prepared in details of the subjects. RRB JE Syllabus for Mechanical Engineering subject is given below. The candidates who are appearing for the examination must see to it that they prepare for the Technical paper according to their respective choice of RRB Junior Engineer Mechanical Engineering Syllabus. Sir/Madam , for Mechanical Engineering only the names of almost all the subjects are given. Is there any possibility to know the topic wise coverage for those subjects? If you are applying in the specialization of Mechanical Engineering for RRB JE Recruitment 2018 -19, then you must have completed your Engineering degree in Mechanical Engineering. Kindly prepare as you have prepared to complete your Btech or BSC Degree. The topics are as vast as they seem to be. You have to prepare all the topics mentioned above. In case there are any changes we will soon update you. how many post RRB je civil in northeast frontier Railway? The Posts are not yet declared. Soon, it will be released and updated here. WHEN WILL BE APPLICATIONS FOR RRB JE BE OUT?? hi sir , in the https://railwayrecruitmentgov.in/rrb-je-recruitment-2017-18/ article.the application date are not mentioned and also in official website also I didn’t find this job title can you help me out. sir, what is the qualification for junior engineer posts and when is the application date. hi Deepika, Read the article you will find your answer. what is the application fee for rrb railway junior engineer 2018?